This is a much younger me, taken on Easter Sunday 50 years ago in Washington Square Park in New York City. I remember that dress so vividly: white dotted swiss with a gathered bodice and sleeves that fluted at the elbow. The floppy hat was light blue and so were my stockings... And I have such good memories of that day: my husband-to-be and I had stopped for a photo shoot on our way to his parents’ apartment for a family dinner. 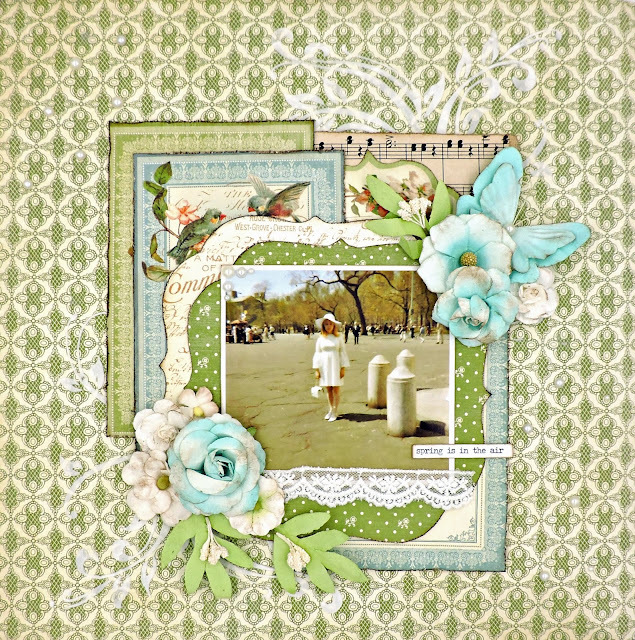 I decided to use the Secret Garden collection by Graphic 45, with the pretty spring colors, to tell my story. I wanted to place a few subtle flourishes in the background, so I started by coating the Meadow Lark sheet with clear gesso to strengthen the paper. The flourishes were made with light molding paste and one of my favorite stencils, Natural Flourish. While waiting for the molding paste to set, I traced and cut a couple of bracket shapes and selected a few cut aparts from the May Flowers sheet. I decided that I wanted one more bracket, this one from the reverse of my base, so I cut one from the center. (Yes, there’s a hole in the center, but as you can see, it’s well hidden.) Next, I tore a piece of vintage music paper – just enough to show behind my other layers. After lightly distressing and inking all the edges, I arranged the papers until I was satisfied and stapled them together and glued it all to thin chipboard to add a small bit of dimension before adhering to the base. I used a tape runner to attach my photo to a slightly thicker piece of chipboard and glued it to my page. I went deep into my flower collection to find the perfect match and selected one full and two partial packages that were just a little too bright. I muted them all with the same ink that I used on my paper edges. I cut my vine in half to fit on the upper and lower corners of the photo and filled it all with flowers and the butterfly. A scattering of pearls, a bit of lace, and a title strip completed my page.